Is Christopher Nolan secretly making Green Lantern Corps.? Almost certainly not, but let's talk about it anyway, just for fun. Nolan is getting ready to shoot a new movie and so far, he is keeping it under tight lock and key. Warner Bros. also isn't saying anything about it, even though casting is well underway, with John David Washington (BlacKkKlansman), Robert Pattinson (Good Time) and Elizabeth Debicki (Guardians of the Galaxy Vol. 2) recently coming on board. Since there is little to no information out there, the internet has been left to speculate wildly. And that wild speculation has led some to think, or perhaps just hope, that Nolan is directing the Green Lantern Corps. movie. Let's reiterate: there is almost no way this is true. The idea of Christopher Nolan returning to do a new DC movie would be too big to keep a secret. Somebody would have figured this out by now. Even so, it's doubtful that Nolan would be interested in doing such a thing at this point in his career. He's far more interested in telling his own stories. That said, this isn't coming purely from a place of wishful thinking. Still, we caution that nobody should get their hopes up on this one. It's just one of those pleasurable, silly things to entertain in a devil's advocate sort of way. Here are the bare bones of it. At one point, Warner Bros. had Green Lantern Corps. dated for July 17, 2020. That just so happens to be the exact date that Christopher Nolan's next movie is coming out. We also know that this was going to be a buddy cop movie of sorts, with the Hal Jordan and John Stewart versions of the character set to feature. Following this theory, people are hoping that it would be Robert Pattinson as Hal Jordan and John David Washington as John Stewart. And those are both casting decisions that would be totally believable. At this point, all we know about Christopher Nolan's new movie is that it's going to be a "massive, innovative, action blockbuster." That could be a Green Lantern movie, sure. But is it? Almost definitely not. Even some of those who have started talking about it on Twitter have exercised a great deal of skepticism, despite whatever wishful thinking exists. Last we heard, Geoff Johns was writing the movie and, according to previous reports, Christopher Nolan penned the script for his new mysterious project himself. This feels like one of those things that could easily spiral out of control in the rumor mill, simply because it's so tantalizing. This is the man who made The Dark Knight. Just imagine what he could do with something like Green Lantern Corps. It's a prospect that's hard not to drool over just a bit. Then again, who knows what could be up his sleeve? This could be the next Inception. There are plenty of people who could probably make a great DC movie, but we've got just one Christopher Nolan. We'll see what he and Warner Bros. have in store for us next summer. 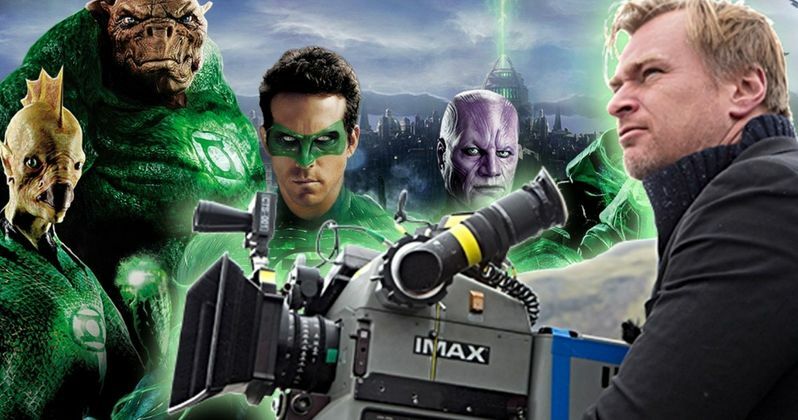 What if Christopher Nolan’s ”untitled event film” set for July 2020 is actually the Green Lantern Corps movie?